This 3000 sq ft home was built in 1999 and recently remodeled. * Located 5 min off I 75 near Twin Cove Marina on Norris Lake. * Upper level has Master bedroom with a king bed- bathroom- walkout deck and Jacuzzi tub. * Main level has living-dining-kitchen- Bedroom with queen bed-bathroom large deck. * Lower level has family room utility room and two bedrooms. Bedroom 1 has walkout to lower deck and a fireplace. Bedroom 2 has a queen bed and a set of bunk beds. Lower deck is covered with outside bar and patio furniture. * This house is very clean well maintained and priced very reasonably. Please note this house is rented only to responsible adults/families. It is not rented for a party house. I do not rent to anyone under twenty-five. I have made this house what I would expect in a vacation rental. People go on vacation to spend time with friends and family but also like to have their own space at times. This house is set up with a bedroom and bathroom on each floor. It also has everything you will need for entertaining. Cable TV and a great stereo system with speakers on the deck and at the boat dock. Sonos System Speakers on deck and at boat dock. Lower deck is covered with an outdoor bar. I have been a frequent flyer of this rental for several years and plan on returning next year. I really can't think of anything it needs but I am sure the owner will add something as he does every year. This rental is private ( my grandkids called it the treehouse ) and there is minimal boat traffic. Everything you need you'll find here but shopping is close by if necessary. Swimming, skiing, fishing or just relaxing...this is the place to be!! Thank you Allen once again for letting us return to your beautiful house on the lake! My family has been coming to Norris lake for the past 30 years with the past 5 years as frequent flyers of this beautiful home. There is nothing that this owner could improve here because we are always 100% satisfied but he will likely find something new to add. You will be totally impressed with the quiet and peaceful location but if you need something to liven up your night the marina around the corner has bands and brew on the weekends. We spend our time enjoying our children and grandkids on the dock fishing and swimming, by the campfire, watching movies and finally enjoying some adult time by the Tiki bar on the deck after the little ones are fast asleep. Thank you Allen for allowing us to enjoy another year at your wonderful home and as always the count down begins for next year! This place has everything for everyone and you will never be disappointed if you stay here! Hi! We love your home and never want to leave! 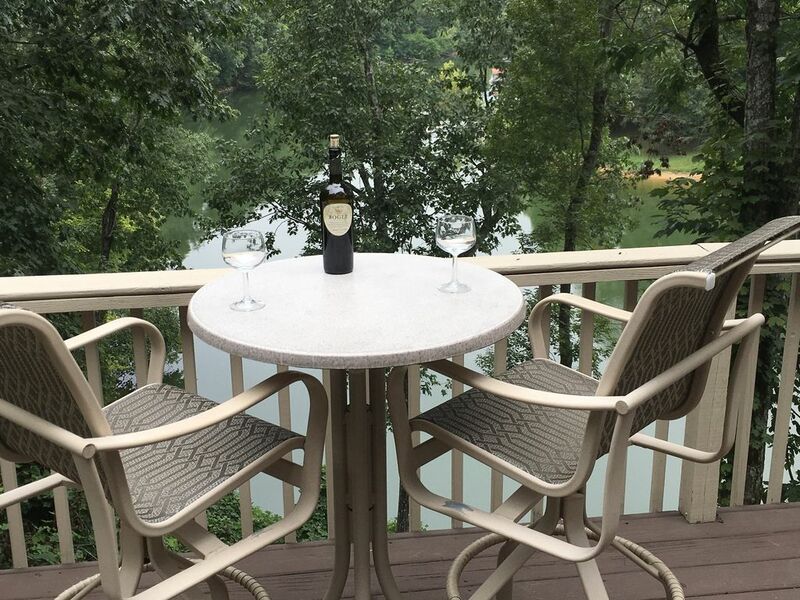 But all good things must end :) thank you for sharing your beautiful home! Best house we have stayed so far in all our years at Norris. Hope you'll have us back again for more memories. My family just returned from another fantastic vacation at this beautiful home. We return every year because this rental offers everything we need. I would absolutely recommend this house to future renters but not before securing our spot for next year which we do during our stay! I have reviewed this home multiple times because it continues to top everything including yearly updates including additional bedroom and covered lower deck which allowed my family to sit outside as a storm passed over. Allen, thank you once again for allowing us to stay in your home. We all get busy with our lives and this one week yearly enables us the opportunity to slow down and enjoy our time with our children and grandchildren. Thank you so much for the wonderful review. I try every year to make improvements to the house for everyone including myself to enjoy. Glad you are looking forward to next years vacation and as always there will be improvements during the off season. Our family has stayed at three other lake houses on Norris Lake and this is by far the best one. We have already made arrangements to stay again next year. This house was perfect for getting away and relaxing. We had 8 family members on this vacation and one dog. We all had plenty of room. We enjoyed the nice views from all 3 of his decks. This house is super clean! You cannot tell that any animals have stayed in this house. It doesn't have an animal odor. The kitchen was well equipped with every appliance and cookware that you would need. The furnishings were very nice and comfy. I got the best sleep on this vacation. We all agreed that the beds are very comfortable. We enjoyed drinking coffee on the deck every morning looking at the amazing views and then walking our dog around the neighborhood. It was easy to back the boat trailer down his driveway. The covered dock provided complete coverage of our boat. There were hardly any waves due to being located in an area that doesn't get much traffic. This was nice because we were able to use the owner's kayak without any problems. We swam off of the dock and believe me if you like to fish there are plenty of fish near his dock. The owner also has a paddleboat but we didn't get a chance to take it out. We would spend most of the day on the lake. Twin Cove Marina is located not too far from this house and they provide entertainment on the weekends and they have good food. We also like to go to Springs Dock, Shanghai, and Bubba Brew's Sports Bar on the lake. This house is located 5 minutes off of interstate 75 and it is close to town if you need to pick up groceries. We enjoyed everything this house had to offer. Allen was exceptionally easy to work with and so welcoming! Thank you for the wonderful review. Glad you enjoyed your stay! My family has been coming to Norris lake for over 20 years and we have always had a great time but this rental kicks things up a notch or two. The owner of this rental is constantly updating this home and continuously gives back to the people who rent from him by doing so. All needs are met here from the boat dock to the privacy of the bedrooms and each with their own bathroom, the kitchen with everything and the beautiful living room with floor to ceiling windows offering a gorgeous view. The location is a winner too in a secluded cove with very low boat traffic. The owner is easy to get in touch with if you need anything but it is likely you will not. We consider ourselves frequent flyers as it would be hard to top this home! * Enjoy boating,water skiing, fishing swimming on norris lake. trails inground pool and tennis courts. * Shopping and restaurants within five minutes. * Fine dining and night life in knoxville just twenty five minutes. * Gatlinburg and Smokey mountains fifty to sixty minutes. street with very little traffic for an after dinner walk. * Plenty of parking for autos and boat trailers.